At the end of September the BASS club had a fish in in Dorset arranged by my pal Steve Pitts. Steve had told everyone that there was a chance of catching fish on bait, lures and fly gear so several of us had fly tackle. Due to poor conditions the first couple of sessions were almost a total write off. We did see a few fish feeding on marine woodlice but the weed was too thick to fish for them. On the second evening, in search of calmer conditions and less weed we went to a spot where deep water runs through a narrow channel under a road bridge. 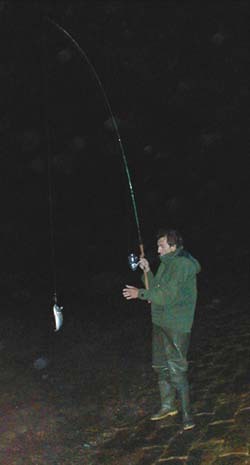 On advice from BASS member Malcolm Brindle we stayed on, into the dark, to fish for scad under the road lights. Lots of fish, including a couple of small pollack took streamer flies and we were treated to an exhibition of quality fly casting by our more expert members. The scad were a lot fussier than you might think and everyone learned a lot about fishing for these little relatives of the 'jack' family. 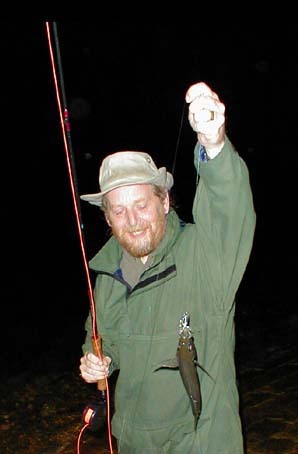 Small streamer flies such as Clouser minnows were very attractive to the scad which really put a bend in the fly rods. Scad took the flies both when they were stripped back at a good pace and when they were swung round in the strong current. 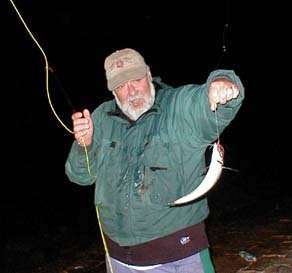 I did not have my fly rod so I tried a small, home made, luminous 'Mepps type' spoon designed for sea trout fishing. The fish were feeding right at the surface but the light (& lighted) lure was just about as effective as the flies despite the relatively heavy bass gear which restricted casting distances a great deal. The lure consisted of a little tritium powered glass tube whipped to the body of the spoon with a strip of transparent polythene.